All modern web browsers offer you save credit card information so that the browser can automatically fill credit card details for you and help you quickly complete online transactions. Microsoft Edge, like other web browsers out there, prompts you to save card information on submission of a form with credit card details. If you accept Edge’s prompt to save the card information, Microsoft Edge securely saves your credit card details. On top of that, it never saves CVV information. While credit cards that you save in Edge browser are stored securely, one should not save credit card information on PCs or smartphones as they are not fool-proof or hack proof. While, technically, no one cannot use your card without the CVV information, we would still advise you against saving card details. If you have also saved credit cards in Edge browser, you might want to delete the credit card details from Edge in Windows 10. This method can also be used to view all saved credit cards and edit their details. Tip: You can stop Edge from asking to save credit card information. 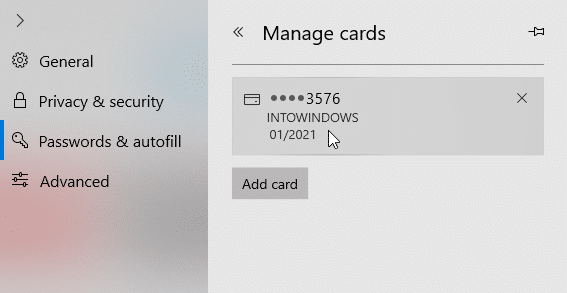 Here is how to view and delete credit card details saved in Edge browser in Windows 10. Step 1: Open the Edge browser. Click Settings and More icon (…) and then click Settings. Step 2: Click Passwords & autofill. Under the Autofill section, you will see Manage forms and Manage cards buttons. Click Manage cards button to see all credit card information saved in the Edge browser. Step 3: For security reasons, it will show only the last four digits on the card along with the name on the card and expiry date. You can view full details about the card and edit the same by clicking on the card info. To delete the saved card, simply click the “X” button which appears when you hover the mouse cursor over the card entry. 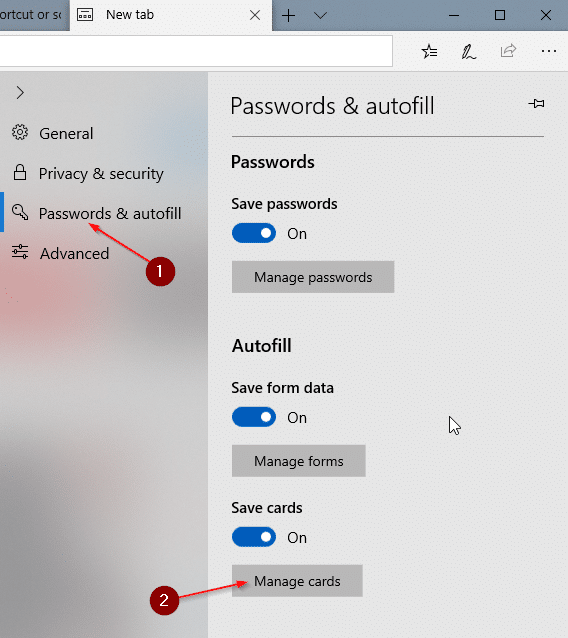 How to view passwords saved in Edge browser in Windows 10 might also interest you. The menus have changed in Microsoft Edge 42.17134.1.0, Microsoft Edge HTML 17.17134; and the X does not appear when you mouse-over a credit card number.